JRLR is an unmatched combination of comprehensive data, analytical tools, real-time entry, broad-spectrum delivery, and experience that provides the most progressive lobbying tool to the legislative professionals of Oklahoma. Real-time legislative tracking and intelligence The Journal Record Legislative Report is Oklahoma’s most advanced and effective legislative tracking and intelligence service, providing comprehensive, up-to-minute, mission-critical information. SEARCH – We find and alert you to the bills that affect you, your business, your clients or your agency with powerful manual and automatic searches. Search by keyword, legal citation, subject, author, progress or companion. TRACK – We organize the flow of legislative proposals in ways that work best for you. Organize – and retrieve – legislation by client, position, priority, subject and more. REPORT – We prepare professional reports, on the fly, to manage your workload, engage your clients or inform colleagues of vital, must-have information, including real-time bill status, meetings, hearings, calendars, contributions, research and analytics. Since 1903, The Journal Record Publishing Co. has been a multifaceted media company that specializes in business,legislative and legal-related information sources. In addition, we produce many specialty industry-related publications and host several statewide events. 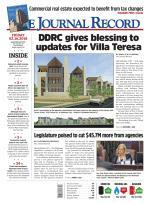 The Journal Record newspaper is our flagship – an award-winning daily general business and legal newspaper focusing on local business trends and in-depth stories that portray the voice of the Oklahoma City and Tulsa business communities.